Brown hamburger in the dutch oven at about 375 degrees for Frying. Move the hamburger to a bowl and stir in the spaghetti sauce. Set aside about 1 oz. of mozzarella cheese for later. Mix ricotta cheese, Parmesan cheese, mozzarella cheese, eggs, and oregano in a second bowl. Break ends of about 4 lasagna noodles to fit in dutch oven, making one layer covering the bottom. Spread 1/3 of the hamburger mixture over the noodles. Spread 1/2 of the cheese mixture over the hamburger. Make another layer of lasagna noodles. Spread 1/2 of the remaining hamburger mixture over the noodles. Spread the rest of the cheese mixture over the hamburger. Make one more layer of noodles. Spread the remaining hamburger mixture on top. Pour the water around the inside edge of the dutch oven. Cover and Bake at 350 degrees for about 45 minutes. If you can stick a knife through to the bottom with no resistance from the hard noodles, it is done. When cooked, sprinkle remaining mozzarella cheese on top and cover for 5 minutes. Let me know how you enjoyed your Lasagna! Hi! 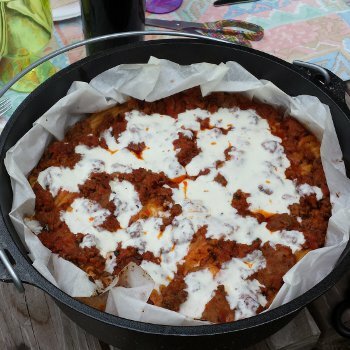 question about the lasagna recipe - "Pour the water around the inside edge of the dutch oven"?? does this mean, between the liner and outside edge of DO? @Tammy - No, if you used a liner like in Ed's picture, the water would be poured inside the liner. Thank you for your wonderful information. Although this recipe doesn't say anything about cooking the noodles first, I was wondering, can I use the no cook lasagna noodles? @Julie - Super! 30 minutes is tough. @Nancy - Looks like Julie answered your question about no-cook noodles. Would this recipe work with a cast-aluminum Dutch oven? Also, is water always necessary to add? @Savannah - Sure, aluminum or iron doesn't matter. If you don't add the water, then the noodles will be more firm, maybe crunchy. I used my cast aluminum Dutch oven without a liner (it's nonstick) and without the water and it turned out just fine! Very yummy. I used Italian sausage instead of ground beef and made a simple sauce with extra seasonings and added garlic and chopped onion to the sausage. So glad I have another use for my Dutch oven! Thanks! Do you think i could pre layer it in a dutch oven and bake 24 hrs later? @Lacey - I've not done it, but I would think it should work ok to put everything except the water in and then keep it refrigerated. Add the water just before cooking. @Lacey - What I would do (and might do, in fact) is assemble it in a parchment liner several days ahead and freeze it in the oven. Then, when frozen solid, lift it out and wrap in heavy duty foil. It'll probably be easier to store the frozen lasagna in your cooler than the whole DO. You'd want to thaw it before baking, though.